Many feared that social media would undermine professional reporting. Defensive journalists derided it. “I would trust citizen journalism as much as I would trust citizen surgery,” quipped Morley Safer, a CBS correspondent. As it turns out, photographs, videos and tweets from ordinary people are improving and expanding news coverage. They also create work for journalists who know how to curate, authenticate and analyse their material. The British newspaper The Guardian has opened what it callx a "data-driven" cafe in London, sparking swift, bitter, funny, as well as bitterly funny reactions in the Twittersphere. Despite the little fanfare to accompany the coffee shop's opening in Shoreditch this week, the Twittersphere got wind of the new cafe and made the hashtag #guardiancoffee a trending topic Thursday. Opened to provide journalists with a workspace, #Guardiancoffee is tech and social media-heavy, with flat screens lining the walls, which broadcast live tweets about the cafe, live coffee sales, and tablets made available at nearly every table which themselves are emblazoned with a lowercase 'g' in the paper's trademark font. Duffy, a once valued Conservative fundraiser now at the centre of the Senate spending scandal, also raised the idea of the party hiring his private company, according to emails obtained by CBC News. Just months after being named to the red chamber by Prime Minister Stephen Harper in 2009, Duffy, a former CTV journalist, was apparently agitating for even more. “I suggested they make me a (minister) without portfolio, so I get a staff, car and more resources to deal with pr fallout,” he writes in a July, 2009 email to an unidentified Conservative. His email continues, “what do I demand. “That the Cons hire my private company and I use the cash to hire additional staff to assist with these gigs?” writes Duffy, who gave speeches through his company Mike Duffy Media. It's a stunning media story in what seems to a be world where any news channel is a good news channel. Rogers Communications Inc. is killing off City News channel after 20 months of operation. Scott Moore, president of broadcast at the Rogers Media division, announced the decision to immediately shut down the channel on Thursday. City News Channel was thought by media watchers to be the signal that would challenge CTV's CP24. For whatever reason, Rogers has no stomach for that competition. In fact, Rogers handling of City News Channel has been odd from the start. It seemed an easy thing for Rogers to bundle the City signal into its package of news sources for which some customers pay good money, and thus deliver a more consistent audience to the service. But they did not. Instead, City News channel seemed to travel all over the dial almost as if Rogers wasn't in control of where it landed. Short term, it is easy to see how Rogers will cut some costs. Longer term, BTV and Citypulse at Six are going to have to watch their local flanks carefully. Andrew Rashbass, the chief executive of the Economist Group, is to join Thomson Reuters to take the newly-created role of chief executive of the Reuters news agency and media arm. Rashbass, who has been with the publisher of the Economist for 15 years, has taken the top post at the Reuters news agency business slotting in above president and editor-in-chief Stephen Adler. He has been widely credited with the continuing successful transition of the Economist, which is 50% owned by Financial Times owner Pearson, from a print- and advertising-reliant title to a multimedia product with a significant digital subscription base. In the year to 31 March 2012 Rashbass was paid total remuneration of £1.05m, including a bonus of £470,000, for his efforts leading the group. On a day he claimed expenses for working as a senator in Ottawa, Mike Duffy was co-host of a CBC political panel covering the Prince Edward Island provincial election, the Globe and Mail reports. An analysis of the PEI senator’s living expenses by the Senate revealed Tuesday night that Mr. Duffy claimed the Ottawa expenses on a day external auditors had earlier found that he was in PEI. Mr. Duffy had returned to the province the weekend before the election and remained there until Oct. 3, 2011 – the day Islanders gave the provincial Liberals another majority government. He was in studio that night, a CBC spokesman confirmed. This is almost comical. Or is he just a hard worker? The Canadian Broadcasting Corp. has pulled an advertising campaign that promoted Postmedia Network Canada Corp.’s rollout of a paid content model for its newspaper websites on the basis that it competes with the national broadcaster’s own digital news site, The Financial Post reports. In conjunction with the introduction of Postmedia’s metered paywalls across all of its online publications, on May 14 it launched a national advertising campaign with print, digital and billboard spots as well as a handful of television ads. Postmedia — which owns Canada’s largest chain of English-language daily newspapers including the National Post — said it planned to spend about $15,000 advertising with CBC television stations in Windsor, Regina and Edmonton. In an email exchange with Postmedia on Monday, CBC’s media sales team said the ads ran for a period of time before an employee from the digital department at one of the stations complained that they seemed to be advertising a product that competes with CBC’s own digital news site, CBC.ca. The national broadcaster’s sales management division agreed and the spots were pulled. “Traditionally we do not run advertising for assets that we compete with,” Alan Dark, general manager of CBC revenue group in charge of media sales and marketing, said in an interview Wednesday. The Canadian Broadcasting Corporation has been given permission by regulators to air commercials on its secondary French and English radio networks, likely by this fall. But critics charge that the controversial decision to allow the commercialization of Radio 2 and Espace Musique has created a “slippery slope” that will change the face of the public broadcaster forever. The decision announced Tuesday is so polarizing that even commissioners on the Canadian Radio-television and Telecommunications Commission, the federal regulator that granted the public broadcaster permission, were at odds. The Town Crier newspaper, known recently as My Town Crier, is ceasing publication indefinitely because of money issues. My Town Crier is part of a chain of local newspapers, including Toronto Today, published by Multimedia Nova serving several Toronto neighbourhoods. Publication ends right away and all its employees have been laid off. Gordon Cameron, Managing Editor published this statement today. George Christopoulos, Toronto Mayor Rob Ford's spokesman, has resigned, according to multiple reports. "Mayor Rob Ford's press secretary has quit", Toronto Sun City Hall Bureau Chief Don Peat tweeted Monday. Ford communications aide Isaac Ransom also quit, according to Toronto Star reporter Daniel Dale. Christopoulos took over as Ford's press secretary in January, 2012. Rob Ford and his brother Doug didn't mince words on their weekly radio show on AM 1010 Sunday, accusing the media of unethical journalism. The mayor called reporters a "bunch of maggots," describing them as relentless and telling listeners "no matter what you say… you’re never going to make them happy." His brother, Councillor Doug Ford added that only "80 per cent of them are nasty son of a guns." 34 years ago, it remains one of the reasons I have never turned my back on any young journalist seeking advice or information, or wanting to use my experiences to help plot their next move. "It is all based on respect, of course, and those who think respect is not hard-earned, or not appreciated once it is gained, would have no idea of what it would be like to have it lost." "So distressing do I find the Rob Ford spectacle that covering a terrible murder trial in Ottawa, as I did for a couple of days this week and last, came almost as a reprieve, a step out of the gutter. "It is diminishing even to watch the daily unfolding of the story, the latest installment of which late Friday saw the Toronto Mayor belatedly deny that he uses or is addicted to crack cocaine. In this at least, the Mayor isn’t alone. . . ."
Rob Ford needs to confess quickly or aggressively deny allegations of him smoking crack in order to politically survive, says a political strategist. "There's no sensible reason for handling it the way they are handling it right now," said Jaime Watt, a strategist whose clients have included former attorney general Michael Bryant. Ford has said little on the matter since the allegations surfaced last week, only calling them "ridiculous" and saying the story is another attack from the Toronto Star. News of the alleged video showing Toronto's mayor smoking crack cocaine has garnered worldwide media attention, including jabs by late night talk show hosts such as Jimmy Kimmel and Jon Stewart. Teenagers are posting more information on social media than ever before, plastering the Internet with their personal photographs, hometowns, schools, email addresses and cellphone numbers, according to a U.S. study by the Pew Research Center. Twenty per cent of teens told researchers they posted their cellphone number online, compared to just 2 per cent who did in 2006. More than 90 per cent have posted a photo of themselves, up from 79 per cent six years ago. Star reporters describe how they got to see the Rob Ford video. "The Star wanted to see the video. Media organizations often pay $500 for a good picture shot by a freelancer, but this price was astronomical. We told him that and continued a negotiation that had already gone on for some time. On the drive to meet the dealer, talk again quickly turned to money. Earlier he told us that another unnamed media organization had offered $20,000, but that the dealers turned it down." Harper speaks to caucus, not to media. Democracy at work? Prime Minister Harper told the Conservative caucus he is “not happy” with the actions of some Senators and with the conduct of his own office. “I did not get into politics to defend the Senate,” said Harper. He said that anyone who wants to use their public office for their own benefit should either leave office or exit the Conservative caucus. Harper’s office decided to briefly allow journalists into the closed-door meeting on Parliament Hill so they could record the prime minister’s remarks before they were told to leave. Once that happens, Tory MPs and senators were expected to grill Harper with questions. Neil Reynolds made a career out of steering Canadian newspapers along uncharted courses, looking for stories with scant regard for the safe or predictable. He wanted storytelling, and got it, by letting reporters off the leash with a rare degree of freedom. Reynolds died of cancer in Ottawa Sunday at the age of 72. Visitation will be held Tuesday, May 21, from 2-4 p.m. and 7-9 p.m. at Mount Pleasant Cemetery Visitation Centre, 375 Mount Pleasant Rd. Worthington's funeral is set for Wednesday, May 22, at Christ Church Deer Park, 1570 Yonge St., at 11 a.m. In lieu of flowers, the family asks that memorial donations be given to either the War Amps or Doctors Without Borders. Worthington died Monday in hospital at the age of 86. Stephen Harper’s Conservatives were hit with another political body blow Friday as Senator Pamela Wallin left caucus, the second high-profile senator in as many days to leave under a spending cloud. Wallin’s travel expenses have been under examination by outside auditors since January and she opted to quit the Tory caucus until the probe is complete. It comes hard on the heels of Thursday’s announcement by Senator Mike Duffy that he, too, was quitting the Conservative caucus after questions about his expense claims and a $90,000 payment from Harper’s chief of staff. Faced with a growing ethical crisis, an angry Harper will hold an emergency caucus meeting Tuesday before jetting off on a trade mission to South America to read MPs and senators the riot act and make clear his displeasure with the spending scandals, the Star has learned. Is the end of appointing journalists to the Senate? Just asking. Embattled Senator Mike Duffy is out of the Conservative caucus after a controversy surrounding his living expenses blew up in a full-blown scandal for Stephen Harper’s government. The once-treasured party fundraiser and bon vivant become a serious political liability this week after word leaked that Harper’s chief of staff, Nigel Wright, wrote a personal cheque for $90,000 to Duffy to cover repayment of improperly claimed living expenses. But the Prime Minister’s Office appears to have been blindsided by Duffy’s claims that he had arranged his own loan with Royal Bank of Canada to cover the repayment. Bloomberg LP raced to reassure clients after a rare misstep that placed the data-and-media giant on the wrong side of Wall Street’s zeal for controlling information. Two of the company’s leaders – chief executive officer Daniel Doctoroff and Matthew Winkler, editor-in-chief of Bloomberg News – have acknowledged that the company blundered by allowing its journalists to see certain information about customers, such as when they last logged in to Bloomberg’s data system. A large-scale copyright infringement lawsuit currently under way in Toronto – reminiscent of similar multimillion-dollar suits south of the border – may have a hard time succeeding under new Canadian copyright law. But that doesn’t mean it won’t achieve at least one other objective: scaring off future illegal downloaders. Voltage Pictures, the U.S. movie studio best known for the 2008 hit The Hurt Locker, is trying to convince a Federal Court judge to force Canadian Internet service provider Teksavvy to hand over the identities of more than 1,000 users. The users are tied to a number of IP addresses that the studio alleges were the source of illegal downloading of the company’s intellectual property on the popular Bit-torrent file-sharing platform. If successful, it would be the largest such effort of its kind in Canada. In the last high-profile case, a record company tried to obtain the identities of just a few dozen alleged downloaders, but failed. The U.S. Justice Department secretly obtained two months of telephone records of reporters and editors for The Associated Press in what the news cooperative’s top executive called a “massive and unprecedented intrusion” into how news organizations gather the news. In a letter of protest sent to U.S. Attorney General Eric Holder on Monday, AP President and Chief Executive Officer Gary Pruitt said the government sought and obtained information far beyond anything that could be justified by any specific investigation. He demanded the return of the phone records and destruction of all copies. "Peter Worthington, founding editor of the Toronto Sun and one of Canada’s most decorated journalists, has died at the age of 86. "Mr. Worthington – who served as a platoon commander in the Korean War and was from a Dallas police station as Jack Ruby killed John F. Kennedy’s killer Lee Harvey Oswald – helped start the Sun from the ashes of the Toronto Telegram and served 12 years as its editor-in-chief. He continued to write columns for the paper until being admitted to the hospital last week with a staph infection. "Mr. Worthington won four National Newspaper Awards during his career, a rare accomplishment that puts him among the most frequent winners since the awards were founded in 1949. He won for feature writing in 1962 staff corresponding in 1969, editorials in 1972 and enterprise reporting in 1978." "His knack was to have cameras live at just the right time to capture the moment in history. That’s why he defied his bosses during the Mexico City Olympic Games in 1968 and continued live coverage beyond the allotted time slot. He sensed that the unlikely group of Canadian equestrians could go the distance. He kept his cameras live, kept the satellite feed, and stayed on the air as Canada’s equestrian team grabbed gold for the first time. "A year earlier, in July, 1967, he raced from Ottawa with a camera crew to be at Montreal’s Dorval Airport for a live report as French president Charles de Gaulle made a hurried exit from Canada after being publicly rebuked by prime minister Lester B. Pearson on the heels of de Gaulle’s infamous “Vive le Québec libre” speech." NatPost takeout on the ethnic press. “Mississauga has 25 papers printed in Pakistani, Afghani, Urdu, Bengali and Punjabi,” says Mr. Saras, sitting in his cluttered office at City Hall, festooned with photos showing him with Prime Minister Stephen Harper and other political figures, such as Mike Harris, David Peterson and Mel Lastman. While some cultural groups in Canada have largely switched to English-language publications, newer waves of immigrants want news from back home. Bell would walk away from buying Astral Media if it's asked to sell any more of the TV specialty and radio company's assets in order to win regulatory approval for the $3.4-billion merger, chief executive George Cope said Friday. Cope said there wouldn't be any "strategic rationale" to buy Astral if it had to sell more of its assets to obtain the OK from the CRTC, which has already turned down the deal once. "If we were to be asked to divest any more of the channels or content, we would not move forward with the transaction," Cope said. Rogers Communications has asked the CRTC to force Bell to sell Astral's English language pay TV service, the Movie Network, as a condition of approving the revised deal. Rogers has told the CRTC it would them take a look at buying the Movie Network itself. Bell said it wouldn't be able to make its strategy of more content available on multiple platforms and more competition work if forced to sell more of Astral's assets. Telecom company Eastlink remains opposed to Bell’s bid to buy specialty TV and radio company Astral Media despite changes to the deal and is asking the CRTC to turn the merger down for a second time. Eastlink says the sale of some of Astral’s specialty TV and radio stations wouldn’t change Bell’s market dominance. Eastlink CEO Lee Bragg says forcing Bell to sell Astral’s pay TV services the Movie Network and Movie Network Encore wouldn’t make enough of a difference to make the deal more palatable. Halifax-based Eastlink says it’s one 20th the size of Bell and it expects negotiations for shows and movies from Astral’s Movie Network for on-demand and mobile platforms to be even more difficult if Bell is allowed to buy Astral. The Canadian Radio-television and Telecommunications Commission is holding hearings into Bell’s $3.4-billion deal to buy Astral. Quebecor Inc.’s news media division took a major hit in the first quarter on a dramatic drop in advertising spending on newspapers. The Montreal-based media giant, on the other hand, says its mobile telephone service performed well, with 18,300 subscriber connections in the first quarter. Operating income in news media – which includes the Sun chain of newspapers and the flagship Journal de Montréal on the French-language side – plummeted 63.7 per cent to $5.7-million in the first quarter. Bell should be forced to sell Astral's Movie Network pay TV service if the CRTC is going to allow the $3.4-billion revised merger of the two companies to go ahead, Rogers Communications Inc. said Tuesday. And, the cable, wireless and Internet giant told the CRTC hearing reviewing the deal, if it were for sale Rogers would consider buying Astral's Movie Network for itself to add it to its own services. Rogers said it expects Bell will impose financial terms to make it more difficult to get the English-language pay TV service's movies and programs and ultimately make it more expensive for consumers. "These are premium services that hold the multi platform rights to 'must have' feature films and HBO series," said Ken Engelhart, vice-president of regulatory at Rogers (TSX:RCI.B). "They are the jewels in the Astral crown. We think it would be unwise to allow these services to be acquired by Bell Media." The CRTC turned down Bell's purchase of Astral Media last fall, saying it wasn't in the best interests of Canadians and would have made Bell too powerful, especially in the TV market. Greg Quill, an acclaimed Australian roots musician and longtime Toronto Star entertainment critic died in his Hamilton home Sunday afternoon. He was 66. Prior to pursuing a journalistic career in Toronto, Quill was a household name in Australia. Throughout the early ‘70s his roots band, Country Radio, released a number of hit singles and albums that resulted in a number of national tours there, where he shared the same stage as Elton John and Creedence Clearwater Revival among others. 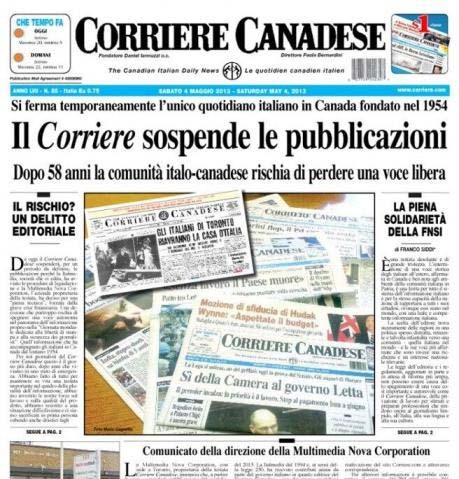 Corriere Canadese, the Italian-language newspaper published in Toronto for over 58 years, announced in its Saturday edition that it has suspended operations. The daily publication was launched on June 2, 1954 by the late Dan Iannuzzi — a third-generation Canadian who later went on to found the multilingual TV station CFMT, now known as OMNI. 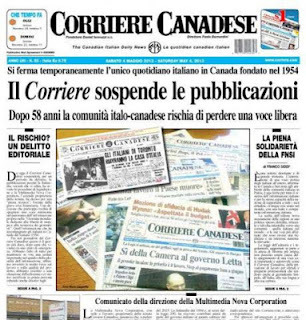 “Fiercely Canadian and Proudly Italian” was Iannuzzi’s personal motto which was printed on the masthead of each edition. The publisher died a few months after his newspaper celebrated its 50th anniversary. An annual subsidy of $2.8-million, which had been provided since 1994, was cut in half as the government under prime minister Silvio Berlusconi sought to slash cultural spending. The newspaper cut its publishing schedule last year from six to five days a week — which meant that its popular weekend soccer coverage was delayed until Tuesday. Inducted into the Canadian Association of Broadcasters Hall of Fame in 1997, Marjorie (Marge) Anthony Linden could be called the first lady of Canadian broadcasting. She was the first female all-night disc jockey in Montreal, the first woman to appear in regular programming at CFCF-TV, also in Montreal, the first female vice-president in Canadian television and the first woman president of the Broadcast Executive Society. Marjorie Anthony Linden, whose roots trace back to rural Nova Scotia, died April 1 in Malibu, Calif., at 77. The Globe and Mail, Montreal La Presse and the Toronto Star each took home four National Newspaper Awards at a gala ceremony at the Canadian War Museum in Ottawa on Friday, May 3, 2013. The Canadian Press had two winning submissions. Other winners were: Barrie Examiner, Edmonton Journal, National Post, Ottawa Citizen, Postmedia News, St. John's Telegram, Waterloo Region Record and Winnipeg Free Press. The winners were announced at an awards ceremony in Ottawa at the Canadian War Museum on Friday, May 3. Winners received cheques for $1,000 and a certificate of award. Runners-up received citations of merit. This is the 24th year for the NNAs under a Board of Governors which includes editors, publishers and the public from across Canada as well as representatives from the Toronto Press Club. Previous to 1989, the NNAs had been sponsored by the Toronto Press Club. The awards are administered from the National Newspaper Awards office in Toronto. Gary McCarthy, a reporter for The Mississauga News, has died following a brief bout with cancer. He was 68. McCarthy took up sports writing after retiring as a CBC news producer. For the past decade, he focused on the Ontario Hockey League, reporting on the Mississauga IceDogs and Mississauga St. Michael's Majors for the Mississauga News. McCarthy’s media career began in Montreal when he was 17. A big sports fan, he considered himself fortunate to meet legendary hockey players such as Gordie Howe, Bobby Hull and Bobby Orr. He covered the Montreal Expos as a Canadian Press reporter, beginning with their first year in 1969 at Jarry Park. In 1972, he began a 26-year career with CBC, working as an anchor of the late-night sportscast in Montreal. He transferred to CBC Radio Toronto a year later and worked as a news editor and executive producer. He climbed the ranks to manager with the CBC National Radio news service before retiring in 1999. Popular SportsCentre anchors Jay Onrait and Dan O'Toole are leaving TSN, according to a release from the sports network. The duo will be taking their quirky brand of humour south of the border where they will join Fox Sports. “Every single day I went into work at TSN, I knew I was going to have fun. It’s a unique and rare work environment that I never took for granted. I am forever indebted to TSN for letting me be a part of it for the past 10 years,” said O’Toole, who worked as a news anchor at Citytv Vancouver in the late '90s. O'Toole and Onrait's unique chemistry has earned them a nationwide following. After their departure from TSN was announced, Prime Minister Stephen Harper tweeted a photo of himself with Onrait and O'Toole, saying "Worst play of the day: Jay & Dan leaving TSN. Best of luck in the US, gents." Onrait and O'Toole are expected to leave TSN in late June. The Washington Post Co. reported an 85 percent drop in earnings, although after subtracting one-time items, profits from continuing operations fell by 55 percent while revenue inched up slightly. The company reported strong operating profits for its television broadcasting and cable divisions. But its Kaplan education unit lost money and its flagship newspaper continued to suffer steady and substantial declines in its circulation and print advertising. The results were skewed by one-time items including first quarter charges of $25.3 million for early retirement, severance and restructuring at the newspaper and education divisions and $4.6 million in foreign currency losses. Postmedia Network Inc. is trying to stanch losses by eliminating the publisher position at its chain of 10 newspapers, which includes the National Post, the Montreal Gazette, and the Ottawa Citizen. A staff memo issued Tuesday afternoon by Paul Godfrey, Postmedia’s president and chief executive officer, said the company’s business operations are being reorganized into three regions, with all editorial functions overseen by the senior vice-president of content, Lou Clancy.